Ask The $250/Hour Trainer: Do I Need To Bench On A Decline? I train professional athletes, I train A-list celebrities, and now I train you! Learn if you need a bench on your decline. I&apos;m a 16-year-old high school football player, and I&apos;ve heard conflicting stories about whether I should do decline barbell presses and dumbbell presses, with some saying they are useless. Can you clear this up for me? 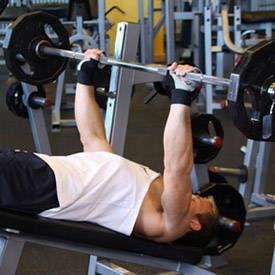 Joe: Decline bench presses do work the chest, and quite effectively! The decline barbell bench press actually lines up more muscle fibers directly in opposition of the resistance (load). That&apos;s why elite-level powerlifters arch their backs as much as possible before performing the movement. 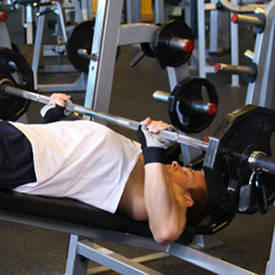 They&apos;ve figured out that arching on a flat bench creates a better mechanical position. Basically, they&apos;re turning flat-bench barbell pressed into declines. Having said that, the blocking motion in football would be closer to a incline barbell bench press with your hands shoulder-width apart (input images). From that standpoint, performing a decline bench press for the sport of football might not be the best exercise choice. We actually have a special bar called a "football bar" at my facility, and I prefer using it for all bench press movements. It&apos;s better for the shoulder joints and has a more direct carryover to most sports. Perhaps your school might consider adding these bars to its training facility. As far as dumbbells go, there are tremendous benefits to incorporating them into a training program. The biggest benefit is that they reveal differences in pressing strength and/or stability between your right and left sides. I&apos;d recommend incorporating more dumbbell work early in the offseason. It&apos;s a great time to work on muscular imbalances that may have developed over the long season. In addition, I&apos;d highly recommend that you mainly perform both neutral-grip (elbows closer to your sides) flat-bench dumbbell presses and neutral-grip incline-bench dumbbell presses, as opposed to using the more traditional approach grip. This will better mimic the path of motion of blocking, promoting overall shoulder health. Finally, make sure to train the muscles of your rear shoulders (i.e., posterior delts, rhomboids, middle and lower trapezius, and the external rotators of the humerus). This will help you maintain balance in the shoulder region, which can help prevent injury and increase the strength of your pressing movements. A couple of exercises that would aid in this goal would be a TRX high row (or inverted row) and the seated dumbbell external rotation.